This German company really started in 1873 when Heinrich Stoll and Christian Schmidt joined up to make knitting machines. Like most engineering companies of the day they soon realized that bicycle production was the ‘new big thing’ and changed their operation. 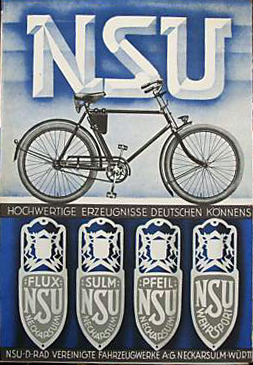 They took the name NSU in 1882 from their new location of Neckarsulm. 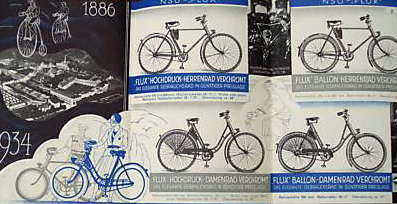 Though they started out making bicycles, like nearly all the future car and motorcycle makers, their bicycle production is generally overlooked due to their outstanding successes in the design and sale of motorized vehicles. Their first motorcycle was in 1901 (with a 1.5hp Swiss Zedel engine). It’s interesting to see the advert below for the NSU 3.5hp 2-speed motorcycle that was made in the same year as this bicycle. By 1955, with the amazing success of the NSU Quickly as well as other models, they had become the largest motorcycle manufacturer in the wold. This cycle was restored for me by my dear friend Pat in Paris. He got it through an exchange with his German friend (who no doubt received some of the bicycles that I’d previously given Patrick). Each of us derives much pleasure from finding and exchanging bicycles. As we often remark, what is not particularly rare in one location is extremely rare in another. Of course, when Pat received it, this lovely old NSU was in a sorry state. He spent a lot of time and effort restoring it. The 1910 NSU Gent’s is a rare bike, and I haven’t found any appropriate 1910 NSU bicycle brochures yet. However, here are some earlier and later pictures, and also a 1910 Lady’s model.